The presence of oil, moisture and dust particles in compressed air is a well known fact for industrial applications. As the technology advanced with inducation of sophisticated modern machineries working on compressed air, the usage of recommended quality class of air as per machines manufacturer or international Standard Organisation (ISO) or Pneurope recommendation has become necessary. The usage of filtered, dry air as per above recommendations results in reduced wear and tear, increased machine uptime, lower rejections, better product quality and above all considerable saving in energy. 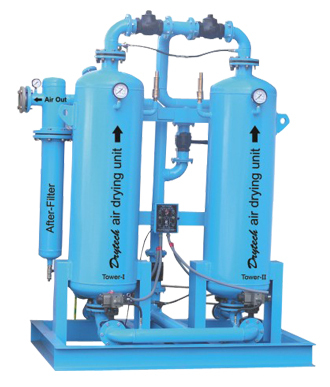 Drytech Air Drying Unit - HD series (Heatless) type offers quality class of air desired as per various recommendations for different pneumatic applications. The stationary air drying unit with negligible maintenance, lesser operating cost and longer service life is the right selection for pneumatically operated machines which needs purified compressed air. The dust particles, condensed oil and moisture in liquid droplets and aerosol from is per-filtered by set of pre-fine filter combination, The Compressed air with only vapourised from of moisture is permitted to enter the desiccant bed tower. 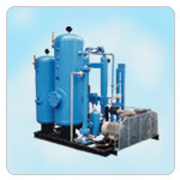 The Saturated Compressed air is dried in desiccant bed tower. 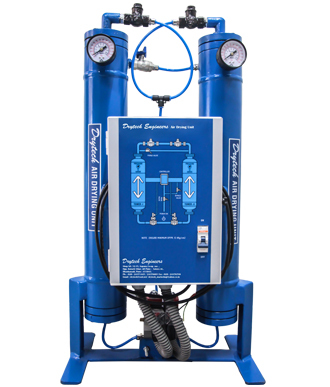 The dry compressed air is refiltered in after filter for removal of residual fine particles if any. The complete ADU operates in following three modes. The wet saturated compressed air coming from set of pre filters is led through one of the inlet valve (Operated by electronic timer) to the desiccant bed tower. The highly hygroscopic desiccant bed with sufficient air resident time due to proper velocity results in absorbing the moisture vapour and dries the air to desired level of dew point. The small amount of dried air at almost atmospheric pressure is led through purge line to the saturated desiccant bed tower. The absorbed moisture in desiccant bed at earlier drying mode is desorbed in purged dry air and regeneration takes place. To avoid the pressure fluctuations at outlet of dryer, the regeneration mode tower is put in for pressurisation before it switches to drying mode. The entire operation is electronic timer controlled and automatic at various modes shown above for proper sequence and timing. The total cycle time is 10 minutes or 4 minutes as per timer selection for required dew point. Quality of air at outlet : Application : To various engineering applications where atmospheric dew point is preferred (-) 40 °C and above. Type : Package consisting of common skid with provision for bare compressors mounting, Inlet / Outlet Air receiver with Dryer having fine filter combination & by-pass arrangement to deliver consistent quality air & pressure at outlet. S / N MODEL FLOW ENDCONN CONN. TYPE OVERALL DIMENSIONS IN MM WT. KGS APRROX.